In addition to turkey and stuffing, this holiday season will bring a statewide crackdown on drivers at Illinois shopping malls who illegally park in spots reserved for people with disabilities. Secretary of State Police — yes, that’s a thing — will be on the lookout for scofflaws at malls throughout Illinois. 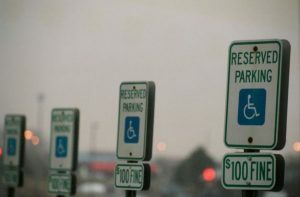 The fine for using a disability parking space without a parking placard or disability license plates can be up to $350. And for the treachery of using a placard or disability license plates without the authorized user/owner present — lawbreakers face a maximum fine of $600 and a possible six-month suspension of their driver’s license. Also this holiday season, the Illinois Department of Transportation and Illinois State Police are seeking to hammer home the importance of their never-ending “Click It or Ticket” campaign aimed at getting motorists to wear seat belts. The two agencies are partnering with 150 law enforcement agencies to increase patrols and checkpoints throughout the state over the Thanksgiving weekend. The effort will last through early Monday morning.